In the midst of recalling Moses Malone's statistical dominance at his peak, all the nights he'd put 35 points and 20 rebounds in the box score, longtime Houston Rockets coach and executive Carroll Dawson paused to throw out another number. The number came out of the blue, just as news of Malone's death came out of the blue on Sunday. Sixty years old. It seems almost mathematically impossible for someone who became a pro basketball player so long ago (1974) and enjoyed a career that lasted 21 seasons. Put it this way: He played his last NBA game 20 years ago and still hadn't reached the standard retirement age in the United States. Then there's the unfathomable cluster of death that has afflicted centers who played for the Philadelphia 76ers. Caldwell Jones died last Sept. 21, at age 63. Darryl Dawkins died last month, at 58. "I was lucky enough to play with them and be around them," said former Sixers point guard Maurice Cheeks. "We don't take friendships like that for granted." Cheeks was still in bed Sunday morning when Andrew Toney, his old partner in the 76ers' backcourt, called him with the news about Malone. Cheeks couldn't quite take it in. Then his phone started buzzing with text messages about Moses. The media requests started coming next, and he needed more time to compose his thoughts. He had just been through this with Dawkins -- losing Malone on top of it dealt him another blow while he was still staggering. After he gathered his thoughts, Cheeks decided he wanted to focus on the time they had together. "Having been in their space and been around them and been in their life, I think that's what we take out of it," Cheeks said. "I look at it and think about them and think about the time I was around them. "Moses brought us the championship. You can't get better than that. But the fact that he was an unbelievable person and clearly one of the best payers ever to play, and he never acted like that at all." By the simple facts, Malone clearly was one of the best players to play, and it's almost as if it took the examination of his career brought on by his death to remind us of that, in addition to some of his pioneering roles. The numbers lead to the reminder that Malone came to the pros straight out of high school; he was 19 years old when he joined the Utah Stars of the ABA. Malone was a pioneer, something that's easily lost to later generations that think of Kevin Garnett as the first preps-to-pros star. Another way Malone was ahead of his time: wearing Nike shoes. 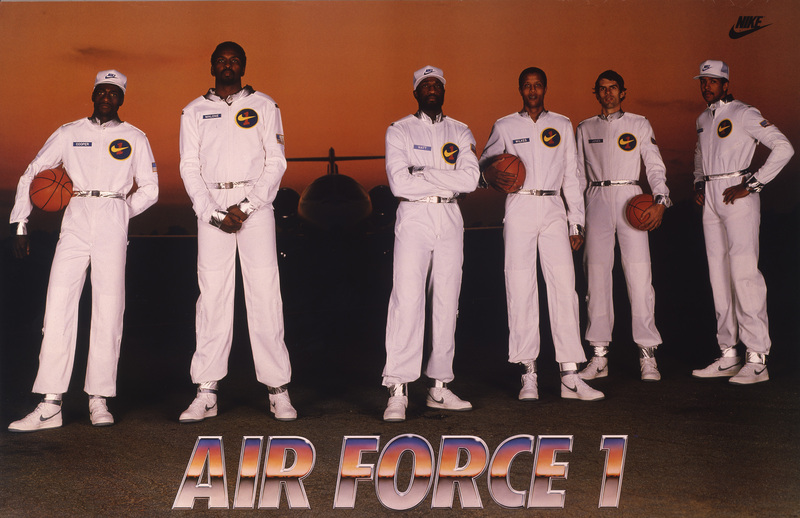 The reason there weren't more Hall of Fame players in the original Air Force 1 poster is that in 1982, all of the biggest names -- Magic Johnson, Larry Bird, Dr. J -- wore Converse. Even Michael Jordan was wearing Converse back then while playing at North Carolina. Jordan signed with the swoosh upon entering the NBA in 1984 and forever changed the shoe game. But Moses was there first. The more you read about Moses Malone, the more impossible it is to avoid the conclusion that Malone is most underappreciated great player of the modern NBA. We think of the early 1980s as the dawn of the Magic-Bird era, but Moses was the guy winning back-to-back Most Valuable Player awards in 1982 and 1983, before either of them got their hands on the Maurice Podoloff Trophy. Malone was so dominant back then that when he signed with the Philadelphia 76ers on Sept. 2, 1982, I still remember how the news broke on the radio: "The 76ers won the NBA championship today." The radio guy was right, of course. Malone arrived in Philadelphia, and in his first season he took the chronically great-but-not-great-enough 76ers from 58 wins to 65 wins and a dominant march through the playoffs, capped by Malone's 26 points and 18 rebounds per game in the Finals. "He took us over the hump," said Cheeks, the point guard on those early-'80s Sixers teams. "He was that physical presence that we didn't have offensively in the paint. That's how he took us over the hump." He also did it by seamlessly integrating into a team that had an established star in Julius Erving, a rising star in Toney and an All-Star in Cheeks. "He just kind of blended in," Cheeks said. "It wasn't even a problem. He said it was Doc's team." And they nearly made good on Malone's classic prediction of "Fo', fo', fo'," as the conference finals were the only one of the 76ers' three series (top seeds got a first-round bye back then) to go beyond the minimum four games. A statement by the Philadelphia 76ers on Sunday called Malone's words "three of the most iconic in this city's history," which is saying something when that is where the words that shaped our country's independence and Constitution were first printed. They were certainly Malone's most famous -- and they typified the minimalism that defined both his interviews and his game. He once described the key to his rebounding prowess -- he is fifth all time in rebounds and has more offensive rebounds than anyone else since they were kept as a separate category in 1973-74 -- by saying "Mostly I goes to the rack." He had another classic retort to Dawson when Dawson first joined the Rockets as an assistant coach in 1980, a year after Malone won his first MVP award. "I said, 'Moses, we need to work on your passing,'" Dawson said. "He put no wrist or finger snap into it. It was all arms. He threw the worst passes I'd ever seen. "He said, 'CD, they ain't paying me to pass.'" It became a running joke between the two. They'd see each other at the golf course and Malone would ask, "You still want me to work on my passing?" Cheeks wouldn't share his pancakes with Malone one time at a hotel breakfast before a game in Milwaukee and Malone never let him forget about it. It wasn't Malone being vindictive. It was more of a bond they had created, part of Malone's penchant for forming lasting friendships. "He was about as loved as anybody I ever coached," Dawson said. Cheeks called Malone "jovial," with a laugh that he still hears ringing in his head. Tony Wyllie got to know Malone when Wyllie was a student at Texas Southern University in Houston and later the vice president of communications with the Houston Texans. Malone was at Wyllie's wedding in 2005, and they had just spoken last week when Malone called Wyllie, now the senior VP of communications for the Washington Redskins, to inquire about getting tickets for their game at Dallas. They were close enough that Wyllie could tease Malone that Shaquille O'Neal would have gotten the better of him if they matched up in their primes. Malone had an answer for that as well. "He said, 'Shoot, Tony, I would foul him out,'" Wyllie said. "He alluded to he would've outworked Shaq. In his day, he used to go up against Bob Lanier and Kareem [Abdul-Jabbar]. Every team had a center, he had to work both ends of the floor. At the end of the day, he had to get a massage from his wife, because playing against the big men would take a toll on him." The biggest drawback to Malone playing when he did was the lack of attention. He peaked just before league's popularity took off in 1984. The Rockets' classic seven-game Western Conference semifinals against the San Antonio Spurs in 1981, in which Malone averaged 28 points, was televised partially on tape delay, Carroll recalled, like much of the 1981 NBA playoffs, including four NBA Finals games. Malone has as many as MVP awards (three) as Magic and Bird. He has more than Shaq and Kobe (one each) combined. He ranks among the NBA's all-time top 10 in both points and rebounds. He navigated his way through the pros without going to college first ... and without anyone to provide lessons on how to do it. I'm not sure whether having SportsCenter or YouTube throughout Malone's career would have helped. His game wasn't tailored for Vine-able moments. He wore opponents down by rebounding again and again and again. He drew fouls (he was one of only four players to attempt more than 10,000 free throws in his career), and if there was a signature Malone image it was him at the free throw line, his goggles slid up his head, sweat dripping down his face. Malone had over 4,000 more rebounds than Dennis Rodman but couldn't match the popularity generated by Rodman's colorful hairdos and wild persona. If it feels like Dawkins' loss was felt just as deeply as Malone's even though their careers weren't comparable, it's because Dawkins had the backboard-destroying dunks and created a flamboyant character that resonated as strongly as any of Malone's statistical accomplishments. Malone's unremitting consistency didn't make lasting memories on the sports landscape. But it formed eternal links for those who knew him, such as Dawson: "He never changed." And if Malone gets left out of the greatest-ever discussions, that might be more a function of who's having the conversation. "He never got left out of my discussion," Cheeks said. "Anybody, when they talked to me, about the game, Moses' name inevitably comes up."